OHH’s six-week paid Nurse Extern Program is a truly unique, hands-on learning opportunity for nursing students prior to their final year of nursing school. The program offers nursing students the opportunity to perform a variety of nursing treatments in a cardiovascular environment, utilize state-of-the-art technology and practice assessment skills under the direction and supervision of an experienced RN. Applicants will be called if selected for an interview and should make themselves available if at all possible. 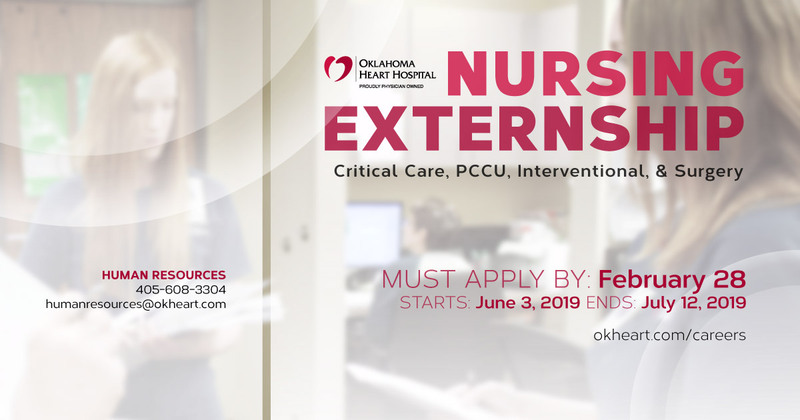 Once the Externship has been completed, OHH has the option to retain the Nurse Extern while he/she completes his/her last year of nursing school. After graduation, OHH also encourages a smooth transition from Extern to Intern to RN and pays for a NCLEX Review Course to assist Nurse Interns in preparing for their boards.